I’ve been thinking about adding more detailed information of extra balls to the rulesheet, as it currently only mentions the one gotten from tomb treasure. Three possible ways to get EBs that I know of are tomb treasure award 5, completing third power feature and making 50 loops. And speaking about the mystery levels, is there a gap for them and are there any super valuable awards available on later levels? 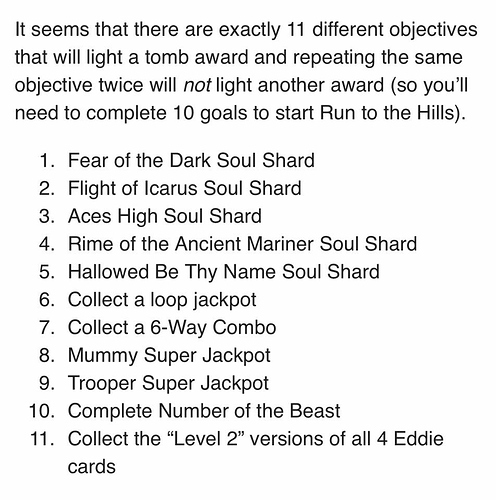 Only recently learned about the spot soul shard award on level 3, which can be really helpful when trying to reach Run To The Hills. On the premium there is an adjustment for an extra ball during the Can I Play With Maddness mode. I believe level 3 is the max. The status report actually lists out all the possible mystery awards based on the current level which is pretty amazing. 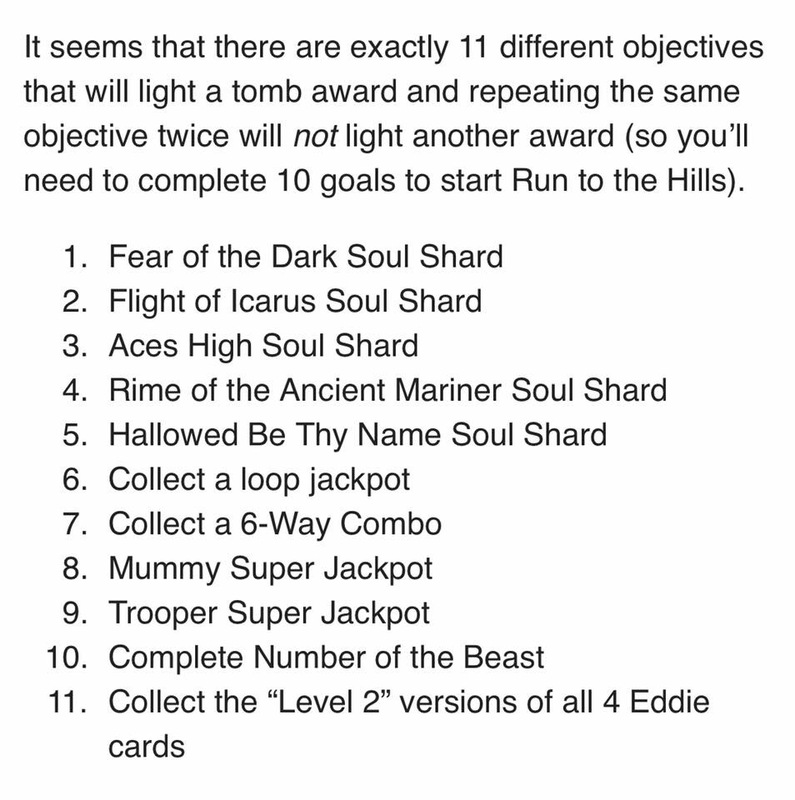 Can someone let me know… if you dont have 4 L2 Eddies cards, can you still get to Tomb award 10 and start RTTH? Yeah thought so… well hell how is it that I completed everything and only had 2L2 Eddie cards? Btw not sure of the order of the Eddie cards on the playfield. The 2 right Eddie cards were flashing. Can someone fill me in on which Eddie cards on the playfield are associated with which feature? Level 3 mystery after 2MTM will spot soul shard. Mummy: get the 2nd Main super jackpot (during mummy mb spell MUMMY again). Trooper: get very far into Trooper mb. Not sure what the cut off point is, but it’s many jackpots (Usually lit red by that time). Last EDDIE: Getting 2x super jackpot during 2MTM. 10 shots, then super jackpot. Advance all Trooper MB JP shots to 3x value (yellow) or collect one 5x Trooper JP (red). 1,2,3,4,5,6,8,9,10 I completed. 7,11. I did not. 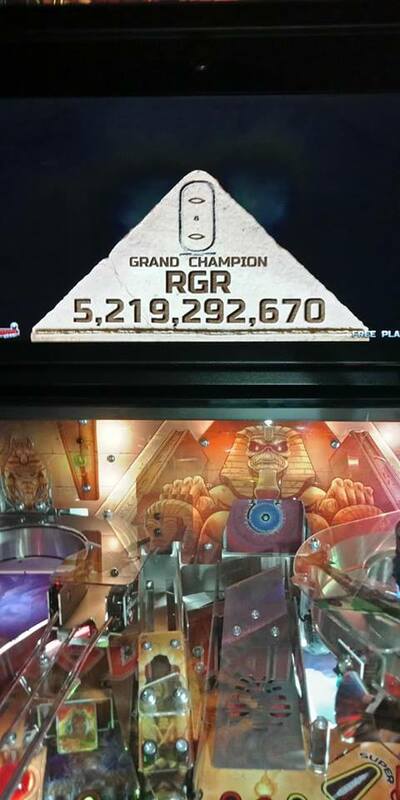 However I had 2 level 1 Eddie cards, but I completed all objectives for all 4 level 2 Eddie cards… The 2 on the left of the playfield were at level 1. Can someone tell me the inserts on the playfield are associated with which feature? Can someone tell me the inserts on the playfield are associated with which feature? I think @Grabowski listed them from left to right. I think its Mummy, Cyborg, Trooper, 2MtM. Can someone confirm? I assume you’d have to get REALLY far into it. I’ve gotten to about the 6th “level” and didn’t light it (though I was never aware there was one at all). Feature Adjustment #59 “Madness Extra Ball Stage” specifies the level for the roving orange arrow to be enabled. Hitting the orange arrow will light the extra ball shot. The default value for this adjustment is 0, which means disabled. Ah. There’s two premiums on location nearby and I’d assume neither of them changed the defaults. Is it a bug or a feature that getting a super jackpot during grace period of Aces or Mariner doesn’t light a soul shard ? As @Theguyoverthere points out, it is possible to score the final needed shots during grace period. It just scores the super and doesn’t do the soul shard hurry up.